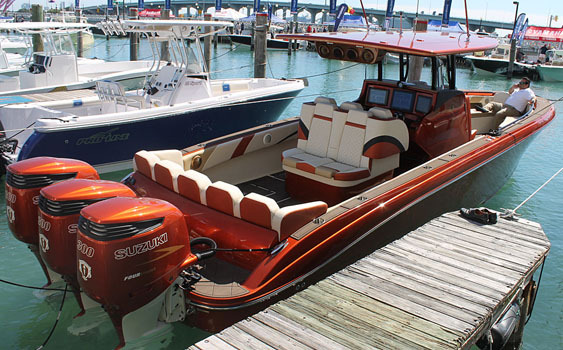 Waves and Wheels handled the entertainment system in Statement Marine’s latest center console that was in the water at the Miami International Boat Show. I clearly remember my introduction to Justin Wagner, the founder of Waves and Wheels in Osage Beach, Mo. It was a humid late-August day in 2006 and Tom Newby—the legendary late Powerboat magazine photographer—and I were standing at the docks of Shooters 21 just dripping sweat while capturing boat detail shots as well as crew interviews and pictures for the monthly publication. Wagner was parked at the famous waterside location that hosted the Lake of the Ozarks Shootout through 2007 in his white 31-foot American Offshore that had an audio system that turned heads before it was even turned on. He found Newby and me, introduced himself and proceeded to show us the equipment in his boat from the amps to the Kinetik batteries he was using at the time for his systems. While Waves and Wheels was just starting to gain recognition around the lake, it was apparent that Wagner was forward-thinking and driven to see his business succeed on a level beyond the lake. Now there’s no way I could predict that you’d see Waves and Wheels entertainment systems featured on several of the most high-profile boats at the 2015 Miami International Boat Show almost 10 years later—and I’m guessing that wasn’t on Wagner’s list of goals back in 2006—but I can’t say I’m surprised. 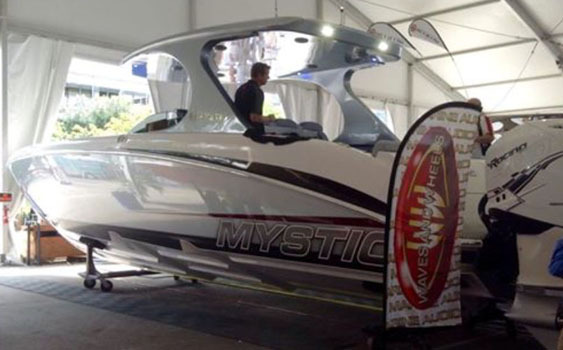 With its new 44-foot catamaran and 39-foot center consoles on display, Mystic Powerboats promoted its partnership with Waves and Wheels. You see, I’ve watched Waves and Wheels grow over the years and become the one-stop shop where any kind of boat—go-fast, runabouts, cruisers, wakeboard, personal watercraft, pontoons, you name it—can get a clean, powerful-sounding system as well as video and lighting upgrades in and out of the cockpit. The shop has also become a go-to for custom one-off projects thanks to a more recent focus on fabrication, upholstery and more. I’ve seen the crew’s work improve while covering many of its custom projects, including Wagner’s own Ironman-themed Hustler 377 Talon from start to finish, for stories on OffshoreOnly.com and speedonthewater.com, and I’ve also seen the company’s stock rise in the performance boat industry by offering its expertise in designing entertainment systems to manufacturers from Marine Technology Inc., Mystic Powerboats, Nor-Tech Hi-Performance Boats, Skater Powerboats, Statement Marine and more. 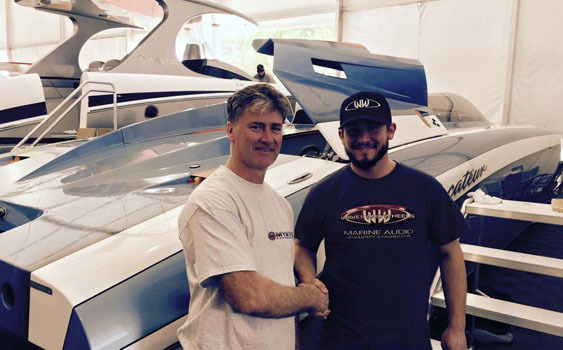 Josh Roark of Waves and Wheels (right) assisted Mystic founder John Cosker with some last-minute boat show preparation. Yet while he’s extremely proud of his custom creations and the high-end projects with poker run enthusiasts such as Derek Wachob, who has built the Corvette-themed and Black Diamond-themed MTI catamarans and requested Waves and Wheels systems in his boats, Wagner said that for every one of the custom overhaul projects they do at the shop, they probably install 20 “nice but standard” systems in other boats. 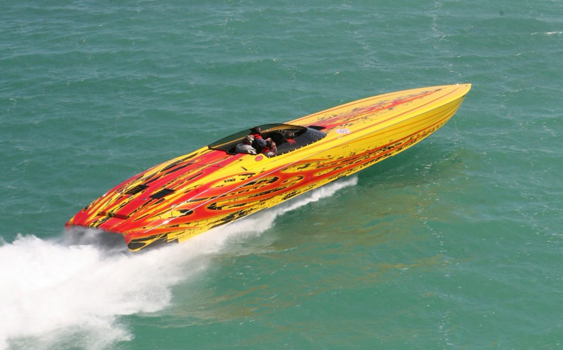 Wagner isn’t one to boast about his involvement in many of the highest-profile performance boats in last month’s Miami show, in fact, he was kind of blown away when he thought about the spotlight his work was under. 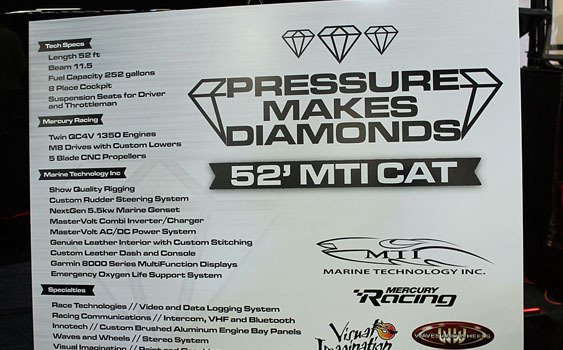 Justin Wagner was proud to see the Waves and Wheels logo on the signs in the MTI booth in Miami. Wagner said it was cool to see his company represented in various booths as he and Waves and Wheels technician Josh Roark walked the show on Thursday. And there are a lot of boaters out there thankful that Wagner chose the career path he did.